Dave Sipe's Folk Art: Wood Reborn! Huge selection of fun, whimsical, and serious art. Sculptural figures, furniture, signs, abstracts and more! Custom or onsite tree carving. 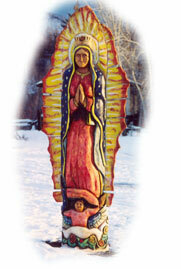 All works copyright Dave Sipe Folk Art Wood Sculptor, 1980-2007. No images may be used, reproduced, or copied without the written consent of the artist.